This map is based on data from the Mars Orbiter Laser Altimeter (MOLA) (Smith and others, 2001), an instrument on NASA's Mars Global Surveyor (MGS) spacecraft (Albee and others, 2001). The image used for the base of this map represents more than 600 million measurements gathered between 1999 and 2001, adjusted for consistency (Neumann and others, 2001, 2002) and converted to planetary radii. These have been converted to elevations above the areoid as determined from a martian gravity field solution GMM2 (Lemoine and others, 2001), truncated to degree and order 50, and oriented according to current standards (see below). The average accuracy of each point is originally ~100 meters in horizontal position, and ~1 meter in radius (Neumann, 2001). However, the total elevation uncertainty is at least ±3 m due to the global error in the areoid (±1.8 meters according to Lemoine and others, 2001) and regional uncertainties in its shape (communication from Neumann, 2002). The measurements were converted into a digital elevation model (DEM) (communication from Neumann, 2002; Neumann and others, 2001; Smith and others, 2001) using Generic Mapping Tools software (Wessel and Smith, 1998), with a resolution of 0.015625 degrees per pixel or 64 pixels per degree. In projection, the pixels are 926.17 meters in size at the equator. The Mercator projection is used between latitudes ±57°, with a central meridian at 0° and latitude equal to the nominal scale at 0°. The Polar Stereographic projection is used for the polar regions north of the +55° parallel and south of the -55° parallel with a central meridian set for both at 0°. The adopted equatorial radius is 3,396.19 km (Duxbury and others 2002; Seidelmann and others 2002). The MOLA data were initially referenced to an internally consistent inertial coordinate system, derived from tracking of the MGS spacecraft. By adopting appropriate values for the orientation of Mars as defined by the International Astronomical Union (IAU) and the International Association of Geodesy (IAG) (Seidelmann and others, 2002), these inertial coordinates were converted into the planet-fixed coordinates (longitude and latitude) used on this map. These values include the orientation of the north pole of Mars (including the effects of precession), the rotation rate of Mars, and a value for W0 of 176.630°, where W0 is the angle along the equator to the east, between the 0° meridian and the equator's intersection with the celestial equator at the standard epoch J2000.0 (Seidelmann and others, 2002). This value of W0 was chosen (Duxbury and others, 2002) in order to place the 0° meridian through the center of the small (~500 m) crater Airy-0, located in the crater Airy (de Vaucouleurs and others, 1973; Seidelmann and others, 2002). Longitude increases to the east, and latitude is planetocentric as allowed by IAU/IAG standards (Seidelmann and others, 2002) and in accordance with current NASA and USGS standards (Duxbury and others, 2002). A secondary grid (printed in red) has been added to the map as a reference to the west longitude/planetographic latitude system that is also allowed by IAU/IAG standards (Seidelmann and others, 2002) and has also been used for Mars. The figure adopted to compute this secondary grid is an oblate spheroid with an equatorial radius of 3,396.19 km and a polar radius of 3,376.2 km (Duxbury and others, 2002; Seidelmann and others, 2002). To create the topographic base image, the original DEM produced by the MOLA team in Simple Cylindrical projection with a resolution of 64 pixels per degree was projected into the Mercator and Polar Stereographic pieces. A shaded relief was generated from each DEM with a sun angle of 30° from horizontal and a sun azimuth of 270°, as measured clockwise from north, and a vertical exaggeration of 100%. 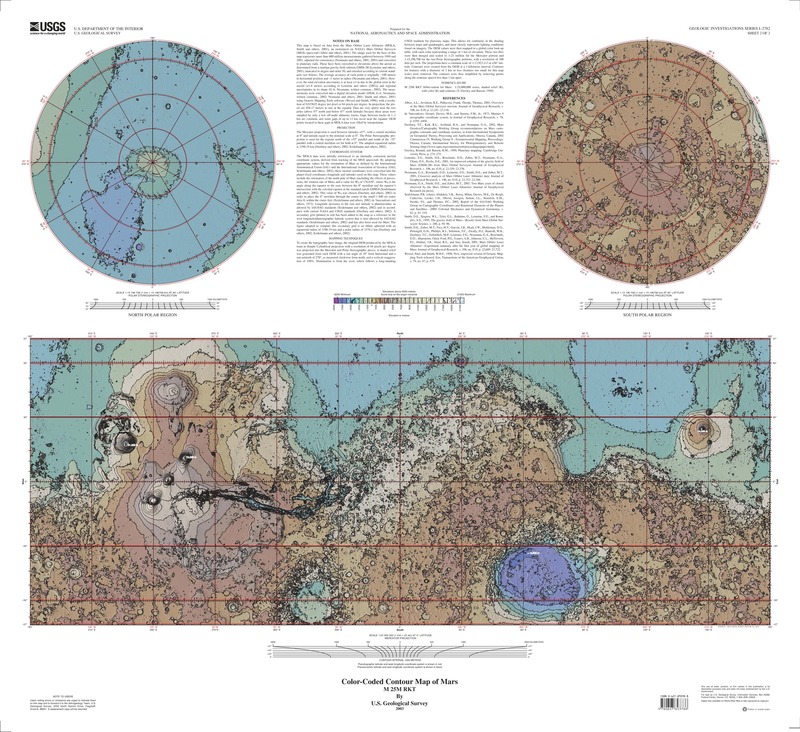 Illumination is from the west, which follows a long-standing USGS tradition for planetary maps. This allows for continuity in the shading between maps and quadrangles, and most closely resembles lighting conditions found on imagery. The DEM values were then mapped to a smooth global color look-up table. Note that the chosen color scheme simply represents elevation changes and is not intended to imply anything about surface characteristics (e.g., past or current presence of water or ice). These two files were then merged and scaled to 1:25 million for the Mercator portion and 1:15,196,708 for the two Polar Stereographic portions, with a resolution of 300 dots per inch. The projections have a common scale of 1:13,923,113 at ±56° latitude. Contours were created from the DEM at a 1-kilometer interval. Contours for features with a diameter of 3 km or less (features too small for this map scale) were removed. The contours were then simplified by removing points along the contours spaced less than 1 km apart. Names on this sheet are approved by the IAU and have been applied for features clearly visible at the scale of this map. For a complete list of the IAU-approved nomenclature for Mars, see the Gazetteer of Planetary Nomenclature. Font color was chosen for readability. Names followed by an asterisk are provisionally approved.